Moving on from pumpkins to other seasonal produce, I have this amazing Shallot Tarte Tatin that was featured in BBC Good Food magazine’s October issue. To avoid whipping out my thesaurus to find a suitable word to describe this Shallot Tarte Tatin with Homemade Puff Pastry, I will just resort to using the favoured acronym of the youth of today; one that all will understand: OMG!! Yes, it was that good. We already know how insanely good caramelised onions are, especially in a tart, but actually in any capacity, they are fabulous. What better than taking small sweet shallots and caramelising them? OMG! Sorry. When I saw this on my iPad edition of the magazine (I can’t get hard copies of it here in the US), I knew right away that I would be making this. I have very little time to cook from magazines and cookbooks anymore (maybe that’s why Martha is being all pissy, no one is buying her books) but every now and then, I make time. If it turns out well, I share it. This is so worth sharing! The recipe itself is very straightforward and incredibly easy and quick, especially if you use ready made puff pastry. But hey, where’s the challenge in that :)? And because I relish the abuse, I decided to make my own puff pastry. I’ve made layered pastry before but I wanted to practice some more and also, and this is the real reason, to buy a decent, butter, ready puff pastry, it’s like $11.00 for not even a pound! That’s insane. I can buy 4lbs (2kg) of butter for less than $8.00! My pastry ended up being organic also, and cost me approximately $6.00 for 2 1/2 pounds! I used less than a pound of it and froze the rest in two batches to make something else later. If you have time, it really pays to make your own from scratch, and that goes for almost anything. This rough puff method was really very quick. It still involved some turning and folding but it was quick. You can have puff pastry in under an hour, but if you can let it chill then it will benefit tremondously. You can make it in the morning and let it chill till lunch or dinner. I noticed it doesn’t rise as much as a traditionally rolled one, but for most things like this tarte tatin, it was perfect. It’s a bit hard to tell with a tarte tatin though, since you flip the tart and all the toppings flatten the puff pastry anyway. When I make my sausage rolls, I will see how well it does. It definitely tasted like a very rich puff pastry and I think it was the home made pastry that elevated the tatin to another level. Serves: 6 servings tart tatin. Makes 2.5 lbs/1.2kg puff pastry. Sift the flour and salt together onto a clean counter top. Add the cold cubes of butter. Using a pastry scraper, cut the butter into the flour. 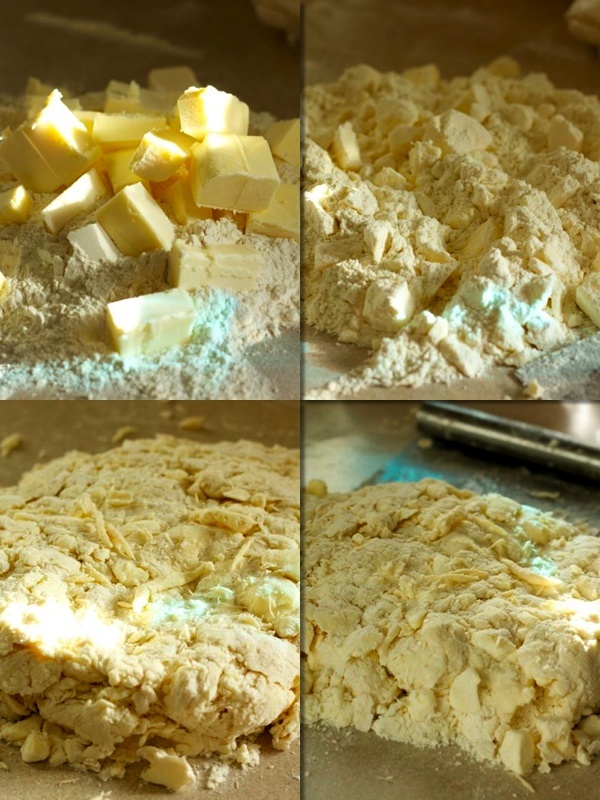 Once the butter is in smaller chunks and is covered with the flour, add the water, a little at a time. You may not need all the water so dribble a little at a time. As you add the water, toss the flour and butter onto itself mixing and shaping. Use the pastry scraper to keep a neat rectangular pile. Add flour to keep it from sticking, but only if really needed. It will be messy and rough. Try and coax the flour and butter globs into a letter fold: into thirds. Turn the pastry "letter" long ways, and roll out the messy dough. It will not be smooth at all, but just flatten the dough out with the rolling pin. Roll into somewhat of a rectangle again and fold into thirds. 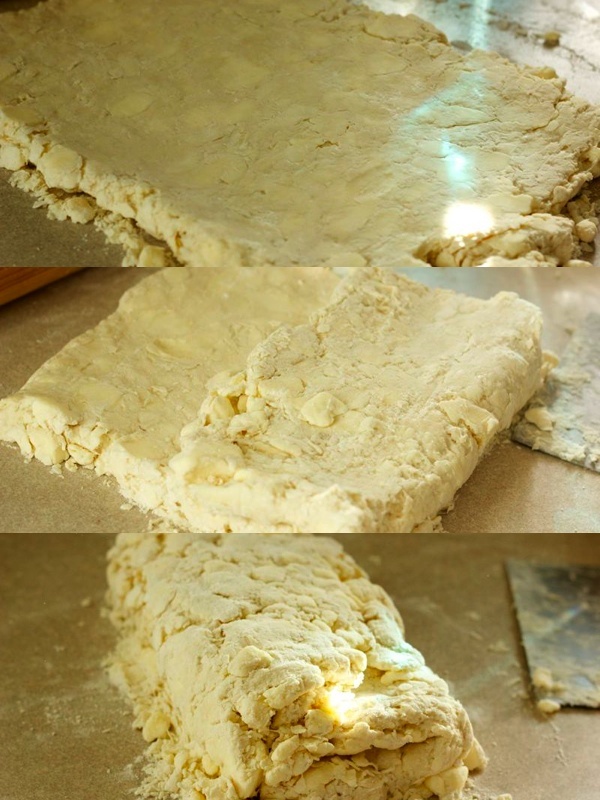 Do this about 4 times and by that time, the dough will be smooth and pastry like. The dough will benefit greatly from chilling after the 4th turn. Chill for 30 minute to allow the butter to firm up and produce those flaky layers. After the dough has chilled, a couple more turns adds more layers but you can use it. Another period of rest can really help the dough so if you are making this ahead of time, chilling will help. You can also freeze the pastry at this point. If you're using it to make the tarte tatin, you need only 1 pound/455g. Divide the rest into two and freeze in portions. Pour boiling water over the shallots and leave them until the water cools. This allows the skin to peel off easily. Peel and halve the shallots, then set aside. Put the sugar in a 9 inch/24cm oven proof skillet, on medium low heat. Heat the pan until the sugar dissolves. Watch carefully because it can burn quickly. Add the butter, thyme and the balsamic vinegar or pepper. Careful since it will splutter. Remove the pan from heat and put the shallots into the pan, cut size down. Roll out the puff pastry, about 1"/2cm larger than the skillet. Drape the pastry over the shallots and tuck in around the shallots. 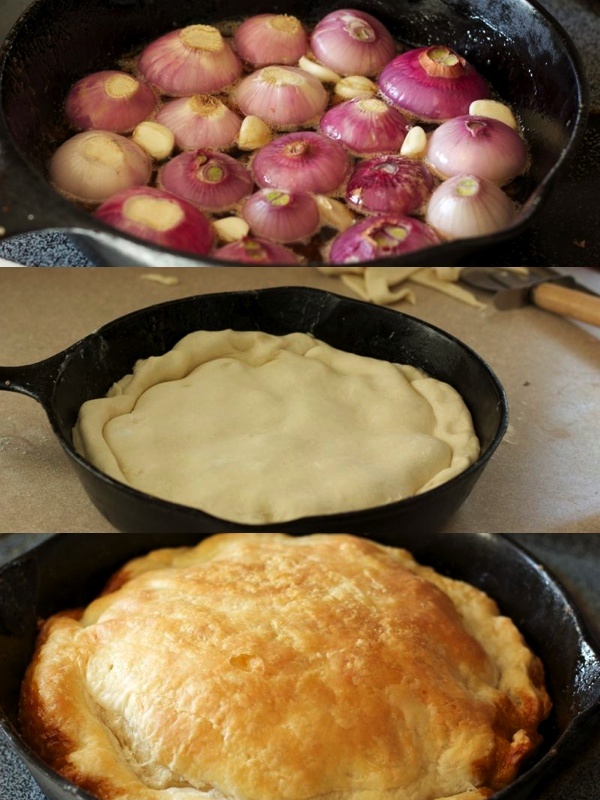 Place the skillet in the oven and bake for 25-30 minutes until the pastry is puffed up and golden. Leave to rest for a minute and then invert onto a platter. So, if you want to break away from the pumpkins, pears and apples of fall, try shallots. You will not regret making this tart. Served with a nice green salad, maybe with some fall fruit or greens and some goat cheese or feta cheese, this makes a perfect lunch or even an appetiser plate. Hope your weekend is going well, my friends. I am at a soccer game today followed by dinner at a friend’s house. I can’t wait to relax tonight; good food, good friends and great conversation, there’s nothing better. What did you do or plan to do this weekend? Been seeing loads of savory tarts lately, but none with homemade pastry and none so delicious. Looks gorgeous! I was drooling over this in your instagram feed but it’s taken me a while to actually look at the post. A savoury tarte tatin would not otherwise occur to me and now I’m really dying to try it out! This was wonderful!! I couldn’t stop eating at all and had to control myself to save some for the others! i adore your skills and passion my friend! Thanks Dedy! Homemade puff pastry is fantastic! I love fried onions and shallots too! I think you would like this, just use ready made pastry. Thanks Kiran! The tart was soooo good! That looks quite beautiful, unusual, and I’m sure delicious. Perfect dreamy brown color! Myyy Nazneen, love the onions on the tarte..perfect. YOU MADE home made puff pastry…hats off my dear. That is some work but quite satisfying. I am completely impressed, how I wish I could eat a slice now. I have my teen sitting beside me and he is bugging me to make this one.. This is such a beautiful tarte tatin, Nazneen, and impressive, too. I’ve never attempted to make my own puff pastry and applaud you for doing so. I find it incredible that you were able to do it in under an hour, too. That really does make it more accessible for us novice bakers. Whether I make my own pasty, I do want to make this tarte. I bet it must taste incredible. Yum! 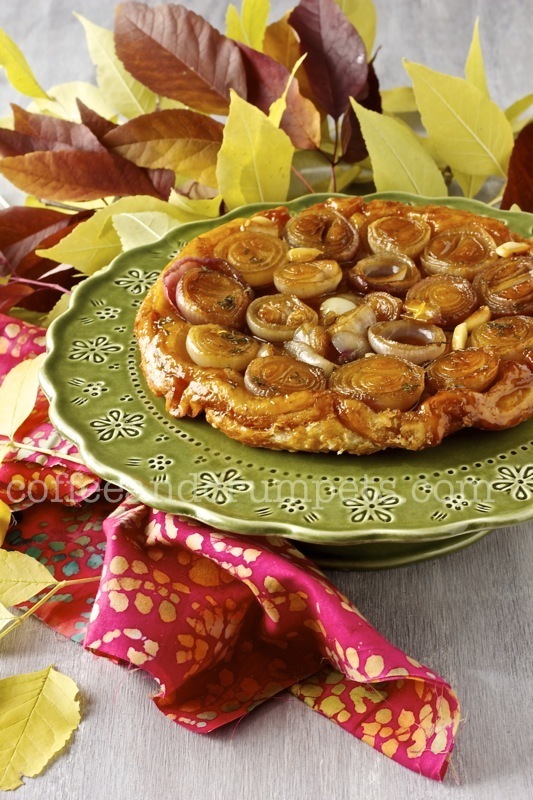 Oh my – caramelized shallots sound so good and they look amazing in this tarte tatin. I’ve never heard of rough puff so I’m glad to learn about it here. It’s good to know there’s a slightly easier way to do it. I’ve never made my own puff pastry but everyone who has says it is light years better than store-bought and I’m sure it’s true. This is definitely a “wow”! I usually buy puff pastry because I don’t use it that often and it does take some time and trouble to make. But you’re right that your own is better, although that really expensive stuff (which is what I use) is quite good. Anyway, super dish – love the flavors in this. Extremely nice recipe – thanks. 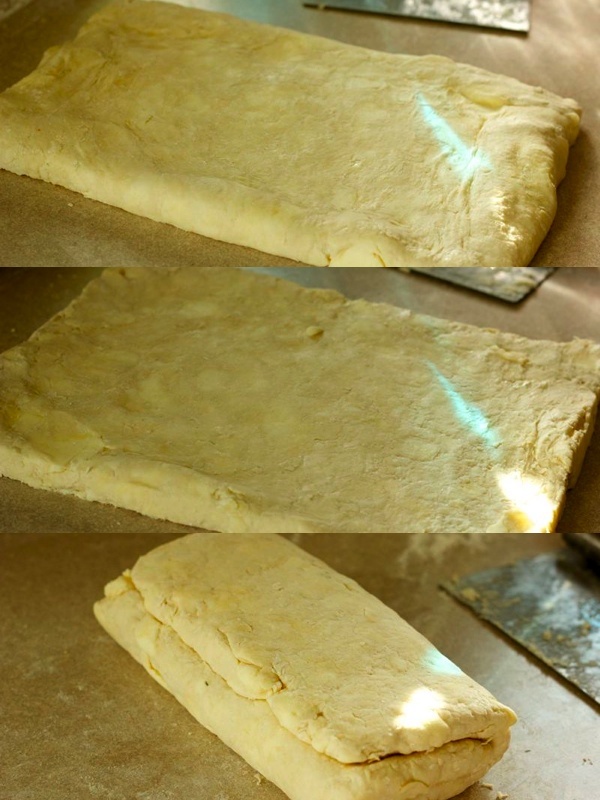 Puff pastry under an hour! Unbelivable and looks so good. I can’t wait to give this a try. I also love the idea of a shallot tarte tatin…the flavours must be gorgeous with the crispy golden pastry. It looks spectacular too. Such a beautiful recipe Nazneen! Your pastry looks gorgeous….so much patience! And I thought you didn’t have time…sigh!! You could open a bakery! Pretty pictures and mouthwatering shallot tarte tatin, Nazneen! CCU recently posted..Candy & Our Winner! As you reacted when you read about this on your iPad, I am reacting the same way reading it in your post! OMG – I have to make this! My quick puff pastry recipe (which I got form a blogging friend) is very similar to yours and it is delicious and SO much better than any pre-made pastry I have bought. I can’t wait to try this! I love the idea of making your own puffed PASTRY!! it looks so perfect. Just like the store-bought. I have to try it next time! Wow, super impressive, and even more impressive that you made your own pastry from scratch! I would have just bought the ready made one.